Alzheimer’s disease affects millions of men and women across the world. People who develop this disease have difficulty remembering short-term memories, but can sometimes in the early stages remember memories from a long time ago. It seems that a diet high in antioxidants can help prevent Alzheimer’s, so why wouldn’t you want to increase your foods that contain these powerhouses. Let’s see some of the amazing health benefits of Pomegranate Juice for the Brain and Memory here on this page. Drinking pomegranate juice regularly could help to fight Alzheimer’s disease, you could be insulating yourself against the development of Alzheimer’s disease because the juice could possibly reduce plaque buildup in the brain. Pomegranate juice offers potent antioxidant benefits which protect the brain from the damage of free radicals. The polyphenol, punicalagin, exists abundantly within the pomegranate fruit. Polyphenols are essentially naturally occurring antioxidant chemical compounds. Pomegranate fruit itself can be eaten to get benefits but with its many tiny seeds, it’s not nearly as convenient. Brain is one of the most active and sensitive part of our body and it is always the first choice for free radicals to attack brain. Citrus fruits and colorful vegetables are also high on Perlmutter’s list of “brainy” foods because of their antioxidant properties. It is preferred more the fruit is colorful the more it is better. 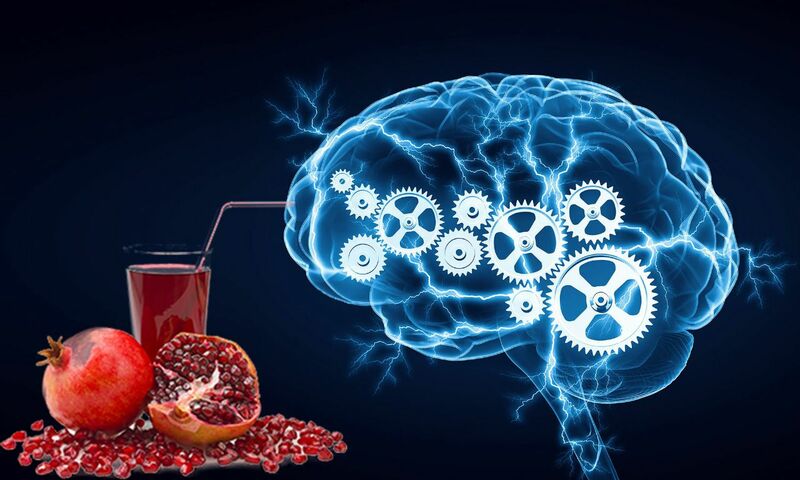 There are many studies conducted and few ongoing on pomegranate effect for the brain. According to the general studies, the affects of antioxidants on brain cells have revealed that people who eat diets rich in antioxidants can enjoy increased protection from free radical damage than those who don’t eat a diet high in powerful antioxidants. The improved blood flow that seems to result from regular pomegranate consumption could definitely play a role in its ability to improve memory and brain function, by increasing oxygen-rich blood to the regions of the brain needed during such tasks. When eaten daily and regularly, the brain’s neurotransmitters are given a natural boost and they become more efficient at carrying and delivering the electrical impulses that contain information. They also contain high amounts of folic acid, which scientists have long ago determined are essential for proper metabolism of the brain’s long-chain fatty acids. Pomegranate fruit and juice is packed with healthy amounts of Vitamin E, which is a powerful antioxidant in its own right and one that can fight the free radicals that attack the body and the brain regularly. Pomegranates are also a great source of potassium, Vitamin B and Vitamin C which are good for your body’s immune system. One Fruit = 100 calories + 25 grams of sugar. Besides being a good source of vitamin C and folic acid, pomegranate juice has excellent antioxidant properties that are responsible for most of its health benefits. Studies have found that pomegranates are good for your heart and blood. This means that you have a better chance of preventing clogged arteries, heart disease and bad cholesterol. Pomegranate juice also helps fight cancer and regular intake could lower the PSA levels that indicates the risk of having cancer in the body. Pomegranate is additionally an honest supply of vitamins, particularly A, C, and E, additionally as vitamin B. Pomegranate is a tremendous fruit, as a result of it contains 3 times the maximum amount antioxidants as each wine and tea leaf. Research indicates that drinking pomegranate juice is beneficial for men’s health, since it helps improve medical conditions that specifically affect men. Compounds in pomegranate may stop prostate cancer cells from metastasizing and may even kill them. Researchers discovered that pomegranate products induce apoptosis or cell death to prostate cancer cells, which inhibits the spread of the cancer. A glass a day of pomegranate juice can slow the growth of prostate cancer. Research has shown that pomegranate juice benefits men by acting as nature’s Viagra. A 2005 study on the long term effects of pomegranate juice intake on erectile dysfunction in animals showed that erectile dysfunction is closely linked to free radicals. Pomegranate juice, being so high in free radical fighting antioxidants, can help fight erectile dysfunction as well. Pomegranate juice might have beneficial effects on sperm quality and motility. A study revealed that pomegranate juice increases the production of antioxidants such as glutathione and catalase, which protect sperm from damage, according to researchers. Laboratory studies have shown that properties in pomegranate juice can increase your heart health by keeping your arteries flexible and decreasing inflammation in the linings of your blood vessels, as well as decreasing and preventing plaque build-up. The peel, bark and leaves of pomegranate square measure utilized in treating abdomen disorders and diarrhea. Drinking tea made up of the leaves of pomegranate is employed in hardening organic process issues, and pomegranate juice is additionally utilized in treating diseases like infectious disease and infectious disease.